The strict separation between the manual work of the factory worker and the automated actions of the robot is being increasingly set aside. Their work ranges are overlapping and merging into a collaborative working space. In this way, human and machine will be able to simultaneously work together on the same workpiece or component in the future - without having to be shielded from each other for safety reasons. 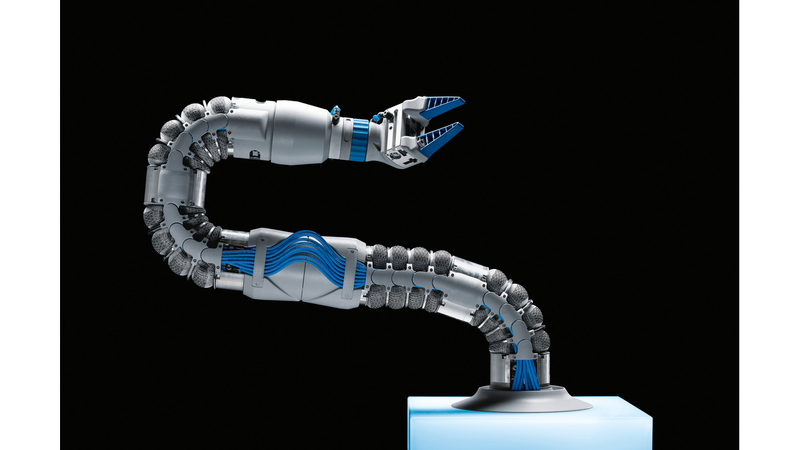 The BionicSoftArm is a compact further development of Festo&apos;s BionicMotionRobot, whose range of applications has been significantly expanded. This is made possible by its modular design: It can be combined with up to seven pneumatic bellows segments and rotary drives. This guarantees maximum flexibility in terms of reach and mobility, thus enables it to work around obstacles even in the tightest of spaces if necessary. At the same time, it is completely flexible and can work safely with people. Direct human-robot collaboration is possible with the BionicSoftArm, as well as its use in classic SCARA applications, such as pick-and-place tasks.